In the busyness that has been my life, I may have forgot to mention on The Blog that I registered for the Twin Cities Marathon. Like three months ago. The plan was to run with my brother (his first marathon) and my dad. My brother bailed out a few weeks ago citing "no time to train." My dad is still in but his training has been sub-par. As for me, after four weeks of running zero miles, I logged a whopping 12 last week and am currently up to 23 for this week. They've all been knee pain-free. So here's our race plan: We're going to start and run until we feel like stopping. If we make it to the finish, awesome. If we don't, no biggie. Either way, I'm not leaving my dad. I owe him a marathon. 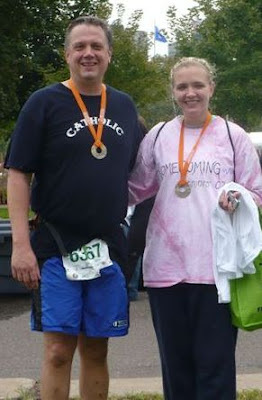 My dad is the reason I started training for a marathon in 2007. We had trained the whole summer, I got injured, and he ran alone. That was the hot year and watching him suffer on the course made my resolve to run it the following year even stronger. 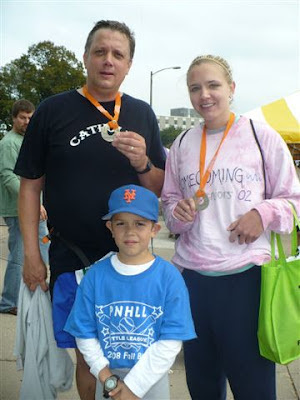 2008 was my first marathon. And my dad's fourth (I think). We lined up together in the start corral but had different race plans, so with a hug and an I love you, I ran ahead. I didn't see him until he crossed the finish line. So this is our year. If all goes well, we'll be crossing the finish line together. If not, we'll be drinking beers at like 10 a.m. It's pretty much win win.